"Lord of the Rings" in the world of "The Lion King" shot like "300". 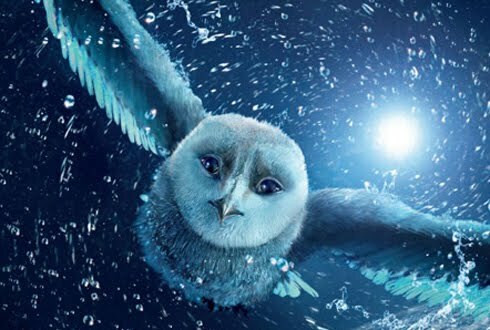 "Legend of the Guardians" is one of the most paradoxical films I have ever had to review. This is not a particularly entertaining film, but it is absolutely riveting to watch. Similarly, there is almost nothing going on in terms of story, yet there is far too much going on for a viewer to care about. If you take any standard fantasy storyline and apply it to this film, you will more or less catch the idea. A young owl is taken out of his home and embarks on a journey to save his loved ones and the world. On the way he finds not only the tools necessary to defeat evil, but awakens a greater destiny deep in his spirit and so on. The reason my synopsis paragraph is structured the way it is is because I literally stopped paying attention to the story and started substituting plots from other films. Also, during one of the hokier points of the film, the accompanying soundtrack during the young one's training montage was provided by "Owl City". Get it? Now, what makes "Guardians" such a compelling film is its absolutely staggering visuals. Director Zack Snyder has an eye for making things look "cool" and this is no exception. All of his trade marks are here, inspirational speeches, crazy, unnecessarily ramped action sequences and shots of characters reacting abound and are all beautiful. Part of the reason why I stopped caring about the film is because I was too busy LOOKING at the film. It also boasts the absolute best 3D I have seen to date and shows how far we have come with this technology in just over a year. "Legend of the Guardians" made me understand how people that liked "Avatar" felt. The story is so by the numbers it hurts, but looking at the film is a spectacle all its own and demands the extra cash for 3D if you plan on seeing it. Unfortunately, much like "Avatar" this is a film that is all sparkle and no spirit, which makes attaching a rating here extremely difficult so I will leave you with this. If you are expecting an epic fantasy adventure, re-watch anything else, but if you are looking for an eye-popping, turn your brain off special effects bonanza, by all means give this film a go. Guardians, or the owl movie, or owls with helmets, or whatever you call it … was a hoot… yah yah I know bad pun. Are you going to take movie advice from someone with such lame puns? Maybe you like lame puns. This movie reverted me back to a seven year old in wonder at the amazing visual aspects. The story was simple. But I don’t mind a simple story. Two young owl brothers, one good, one with the capacity for evil get captured by a twisted cult that believes that only the ‘pure’ ones are meant to be in charge. Think White Supremacist for owls. The not so good brother drinks the Kool-Aid and starts to believe that the group has got it all right. The good brother escapes and embarks on a journey to get help from the fabled Guardians. He and his rag-tag group of buddies find the Guardians and explain the danger to the land. I think it’s about here that it cuts to an Owl City song. Yes that was weird; yes it took me out of the movie but it was also fun and kinda cute. It was, in essence, a breather in the middle of the movie. Then it cuts back to the good brother meeting his hero and being trained by him and then the good guys battle the bad guys. Brother vs Brother. I don’t want to tell you how it ends; besides you probably already have figured it out. Which, I repeat, I don’t think is a bad thing. I cannot compare Avatar in 3d vs Guardians because I did not watch Avatar in 3d. I had to watch Avatar on rifftrax in order to make it palatable and even then it was a stretch.